Hey guys, first time reviewer, I'm not heaps good with the writing.... so go easy I'll do my best to keep things brief and let the pictures do most of the work. 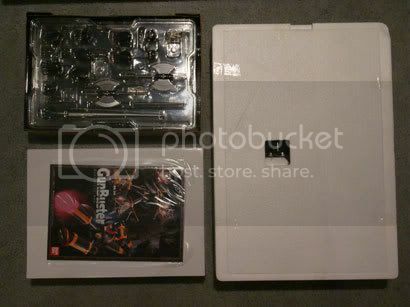 Typical Japanese packaging.... nice and big with lots of great pictures. He comes packaged in the ship modes layed out in polystyrene with all the other bits and pieces layed out in their own boxes. Great upper body articulation, not so much on the lower but this makes him nice and steady. This is the part that blew me away..... accessories!!! 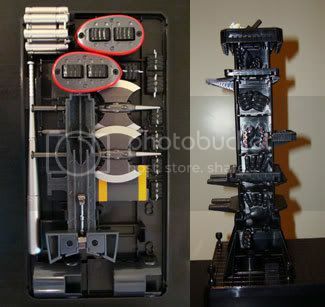 Comes with 6 sets of hands, spare set of feet, bunch of weapons and some random little add ons. And best of all it all stores away in the display base. 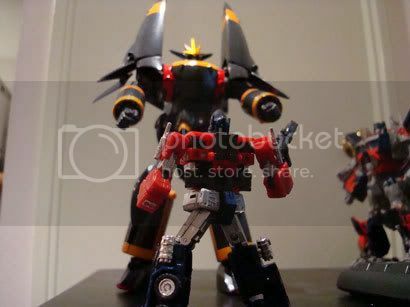 Hey you got any site with comparison pics of this guy and a Mazinger Z? 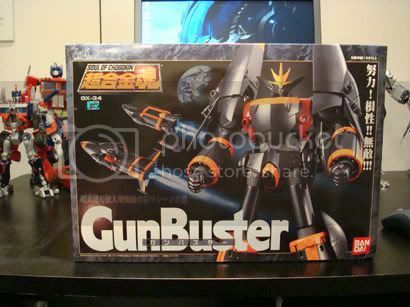 Don't have the Mazinger Z but by the looks of this vid his head comes up to about gun busters chest! but with the wings hes about the same over all. 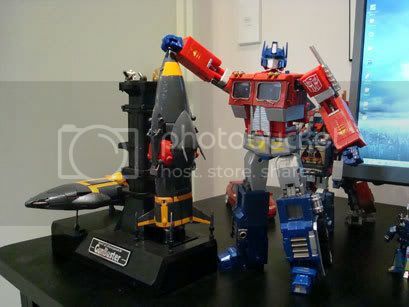 He's MEANT to be taller than Prime... Damn!!! That is sooooooo impressive I want one NOW!! When are your new tees coming out bro? I'm dying to see your new stuff. How would I know? Go ask your mother. How quaint. 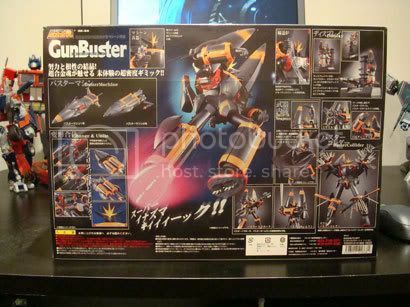 I was browsing Trademe and came across a Gunbuster for auction. Anyone who wants one could probably go for this, but from the description, it sounds like its reserve is around $200-ish. 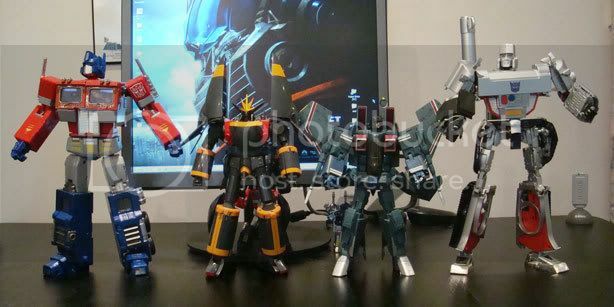 Gunbuster's size looks decent enough to me. The Masterpiece Legioss I picked up recently barely even reaches Prime's hips, but is a neat well detailed piece nonetheless. I hate to say it, but sizes doesn't always matter. However size does help by giving more room to work with. Oh lord! I want, I want, I want! oldman wrote: That is sooooooo impressive I want one NOW!! Oh lordy this guy rocks! He is sooooooo detailed and the amount of accessories blows the mind! Plus I got him for $130 all up!!! oldman wrote: Oh lordy this guy rocks! He is sooooooo detailed and the amount of accessories blows the mind! Plus I got him for $130 all up!!! Owww you got him. Congrats! 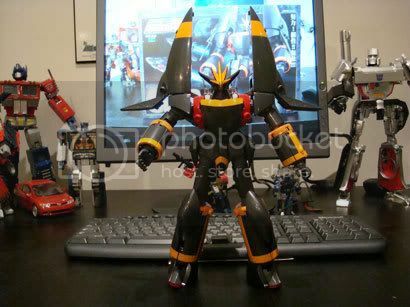 You sir make me extremely depressed that we don't have any local stores specialising in model robots like this. They've got lots of speciality toy stores for war gaming, model trains, model cars, but where are the robots? What else you got lined up to get? Sorry to resurrect an old thread, but did you ever end up getting Ideon? He looks seriously cool and I'm very tempted to pick him up soon. 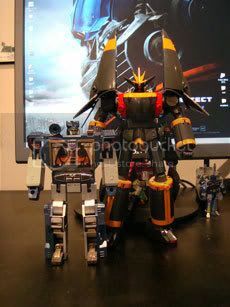 I've been looking at the Soul of Chogokin's a lot lately and I'm pretty keen to see/hear what they're like.